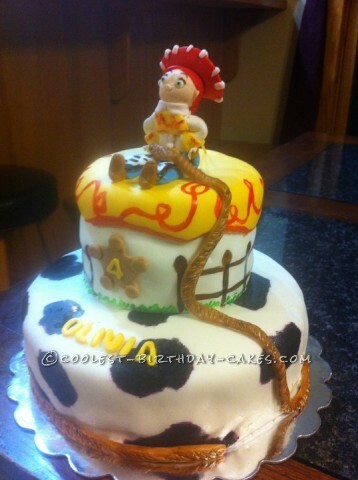 This Jesse Toy Story Cake was one of the first cakes I made with a fondant figure. It is a two tiered chocolate cake with marshmallow fondant. After baking and leveling the cakes, I filled them, stacked them, and covered them in fondant using wooden dowels for the supports. Then I let the decorating take over! The black cow spots are painted on with black gel food coloring and a little bit of vodka. (Don’t worry the vodka evaporates completely!) The fence, grass, and red line were also painted onto the cake. To make Jesse I just looked at a picture and went with it. I rolled the fondant and glued the arms and legs onto the body using water as the glue. I found out how to make figures by watching you tube! There are so many videos on there. This website has also helped so much. The star and ropes were also made by hand without cutters (I didn’t have any at the time). I just textured the rope using a toothpick. This cake was very fun to make and I made it for one of my friend’s daughter’s. Birthday cake idea posted by Shannon H.